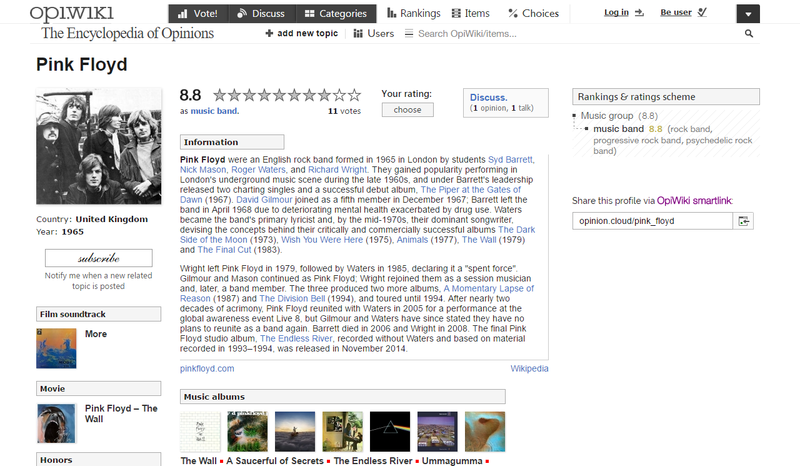 OpiWiki is The Encyclopedia of Opinions. It's a website designed from scratch to contain people's opinion on any topic in the most meaningful way possible. Full of unique solutions and embedded in a beautiful layout, it's a website unlike any other. 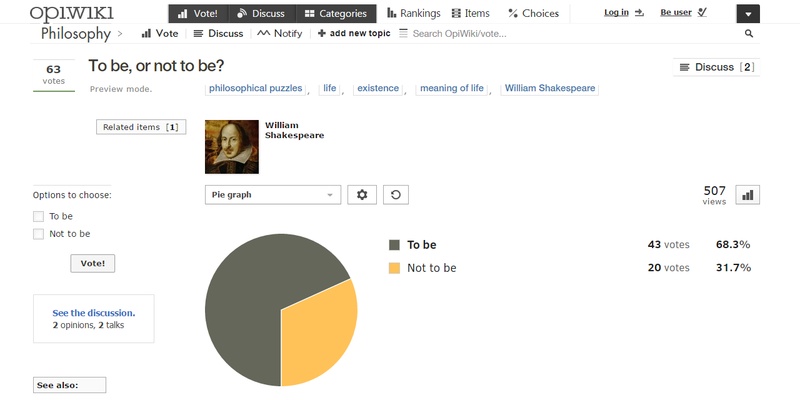 OpiWiki's subject matter drifts around the concept of an opinion. An opinion understood not necessarily as a personal taste, but also as a statement, viewpoint, or judgment about matters that are less than absolutely certain, or about matters that are related to personal uniqueness. Therefore, our content is significantly related to knowledge, experience, intelligence, or idea. The Encyclopedia of Opinions; Although we're not an encyclopedia, we aspire to share some attributes with encyclopedias, in terms of the format, prestige, elegance, quality, or character. 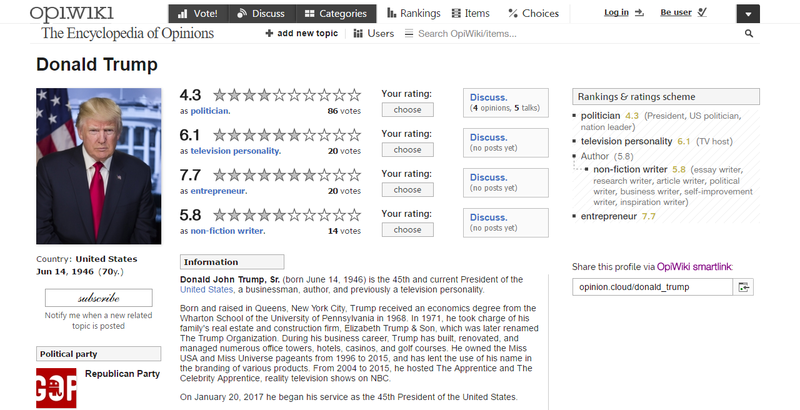 OpiWiki has five main tools to contain the subject matter: votings, discussions, items, rankings, and categories and tags. The content is being created by OpiWiki users – any user can create a new entry. These entries are collaboratively edited. 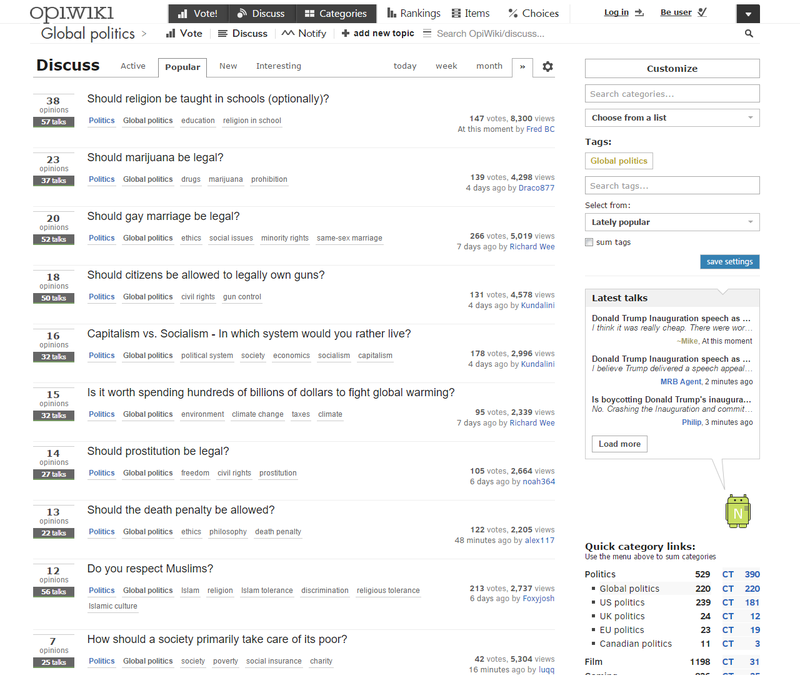 Also referred to as polls, OpiWiki votings are our tool to extract people's opinion in the quickest and often most effective way possible – by voting. 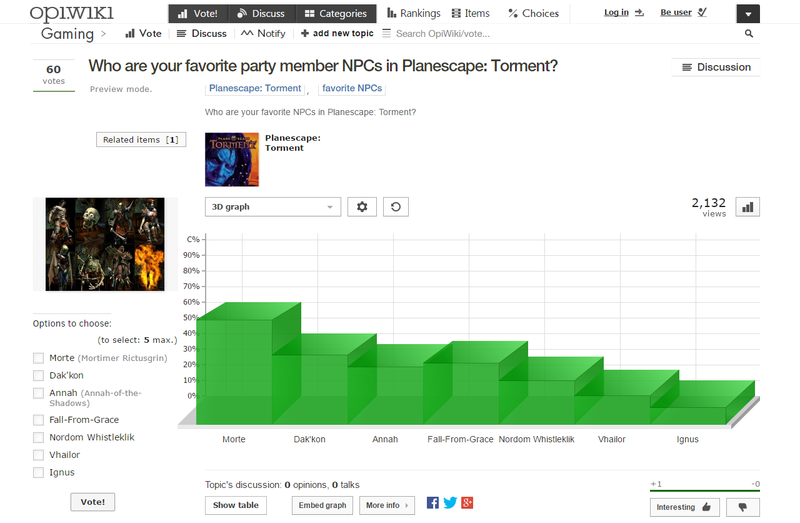 The results are presented live in OpiWiki's original HTML5 SVG graphs. Every voting has its own dedicated page with options to filter the results or share them. 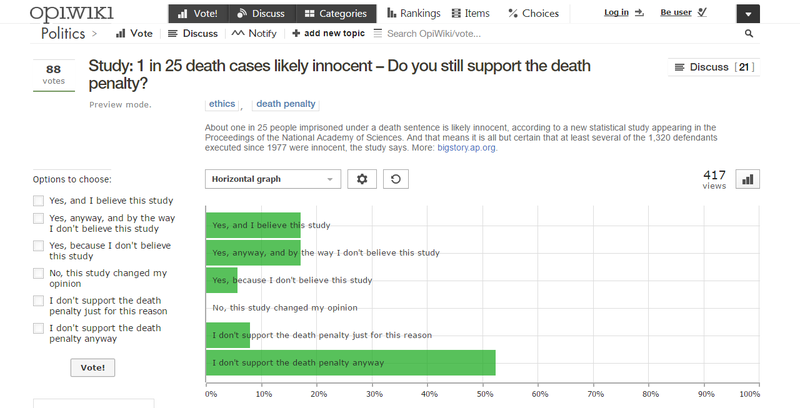 Discussions are the heart of OpiWiki. We strongly believe in substantive discussion and that's why we've created the best system for discussing so far created in Internet's history. It's designed to be able to handle hundreds of talks in a single discussion, keeping it very clear at the same time. The secret is our layout, scripting, rating system, and notification options. OpiWiki is designed for that. We're not treating opinions like comments that are meant to be lost over time, but more like a Wikipedia article is treated. 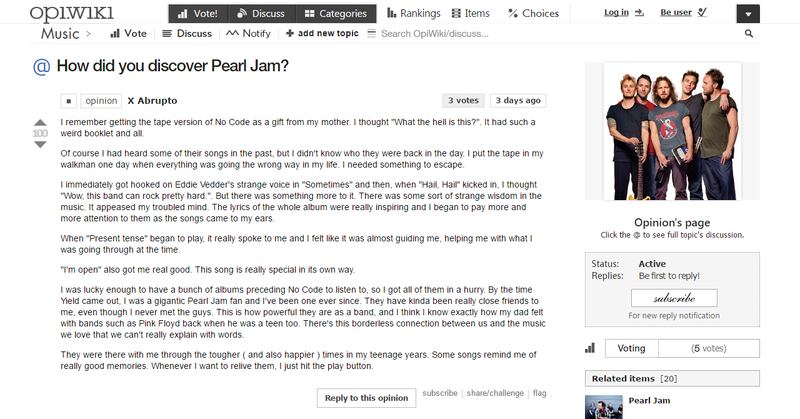 Every OpiWiki opinion has its dedicated page and it's there to stay. Our rating system is not based on the number of upvotes an opinion has received, but on the percentage of upvotes. If your opinion is well-written, it can quickly climb to the top, even for discussions with hundreds of opinions. 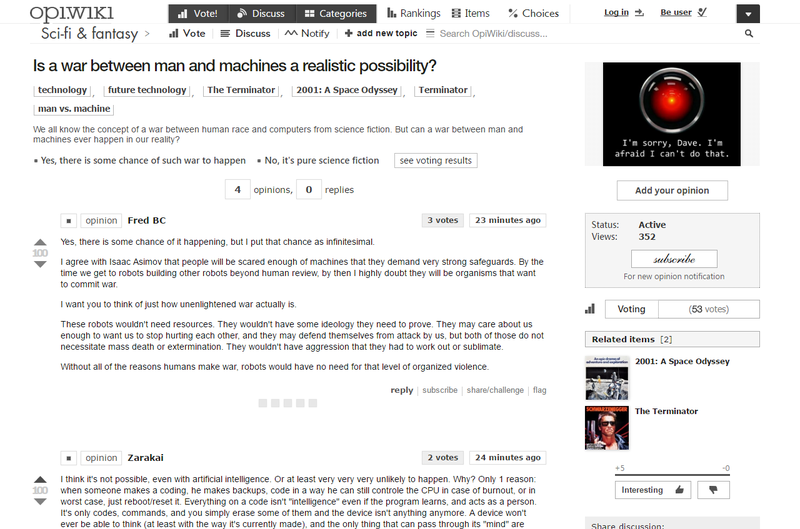 On OpiWiki you can subscribe to topics, categories and tags, and also to opinions and replies. If you're curious about a response to a certain topic or opinion, simply click the subscribe button and the new opinions or replies will be delivered straight to your OpiWiki inbox or email, with the possibility to unsubscribe with one click without logging in. 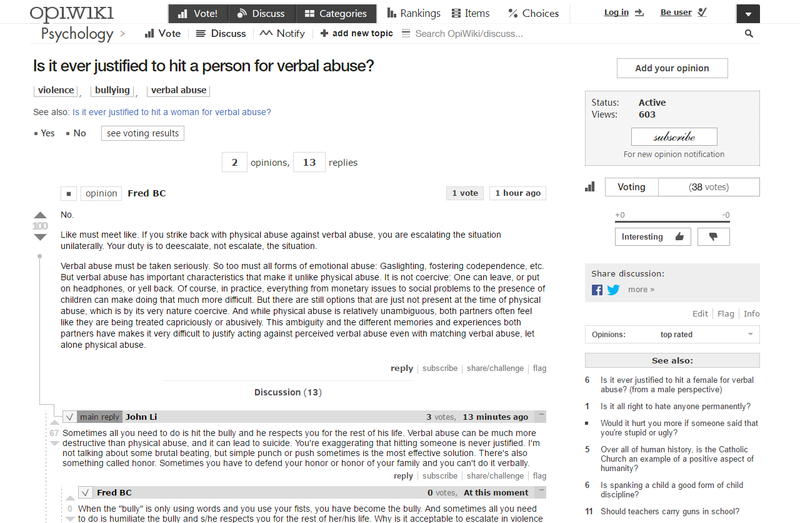 OpiWiki users can also challenge each other to reply to a certain topic or opinion. If you're interested about some user's opinion, simply go ahead and send them the OpiWiki challenge invitation. Discussing is also directly connected to our main user points – the karma and the accordance. 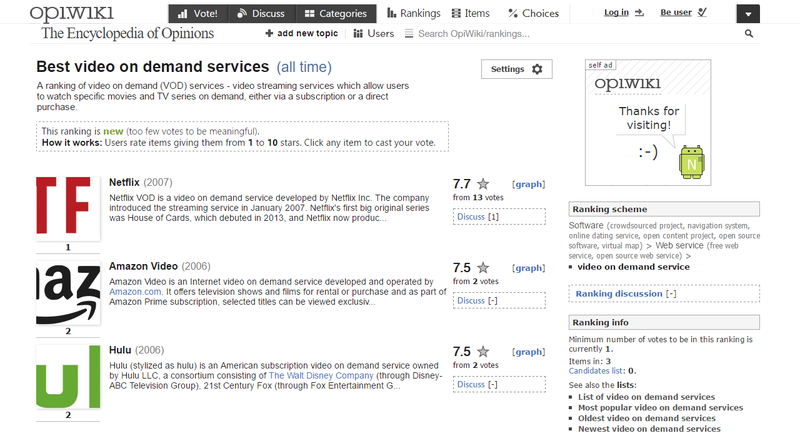 OpiWiki items is our database of persons and things that can be rated. 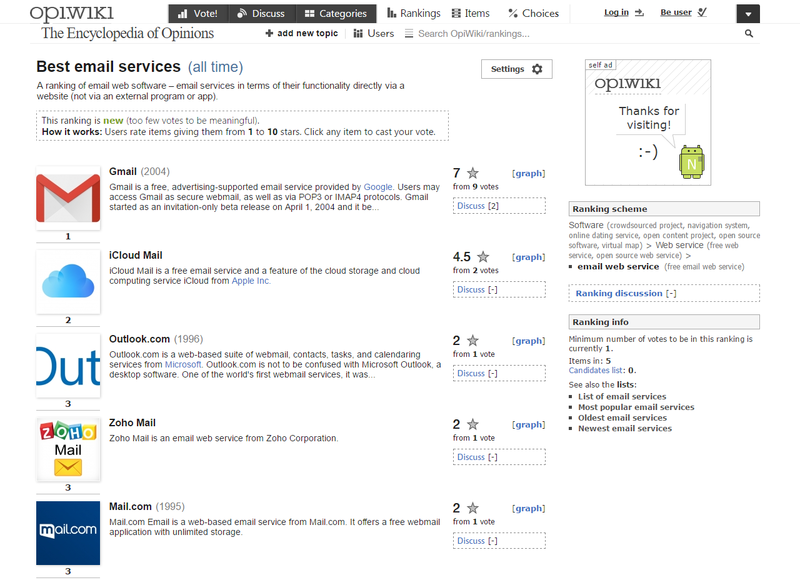 Every item has its own page, can be rated in mulitple areas and listed in multiple rankings. OpiWiki rankings is our groundbreaking tool to answer questions starting with the Who/what is the best/greatest/favorite/most interesting. Rankings are being created and voted by the users, and there are almost no limits – it can be a ranking of athletes, novels, video game developers, music live performances, politicians, countries to live in, or fictional characters created in 2017. 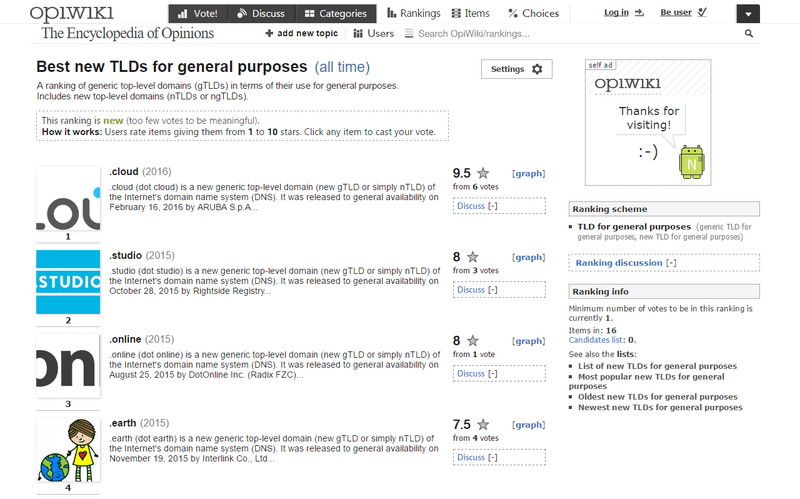 The key difference between OpiWiki rankings and rankings you may have seen on other websites, is that OpiWiki rankings are designed to be meaningful and prestigious. 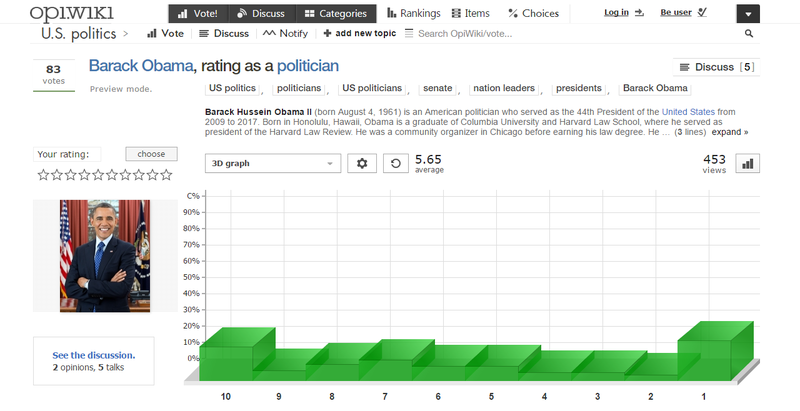 Being on top on an OpiWiki ranking is supposed to be a great achievement in the future. 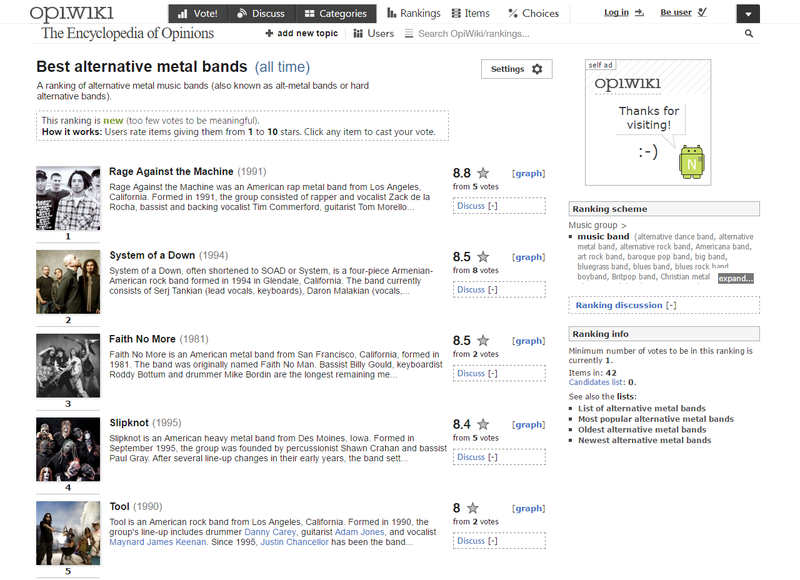 OpiWiki is a big platform and to make it work, we needed a special system to categorize our content. 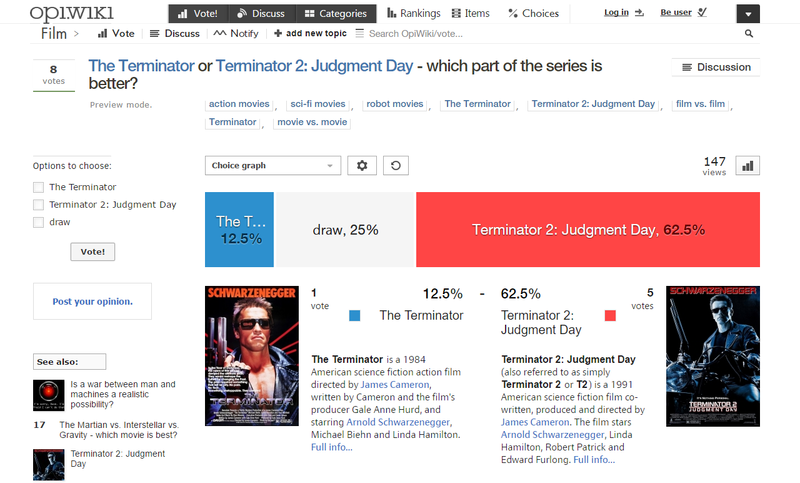 The Categories page lets you find the most interesting topics in just a few clicks. 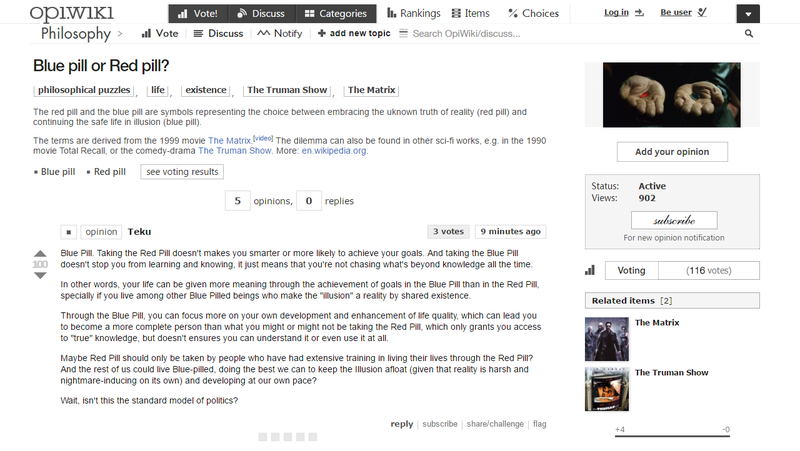 You can also customize OpiWiki or subscribe to any category or tag to receive light new topic notifications. 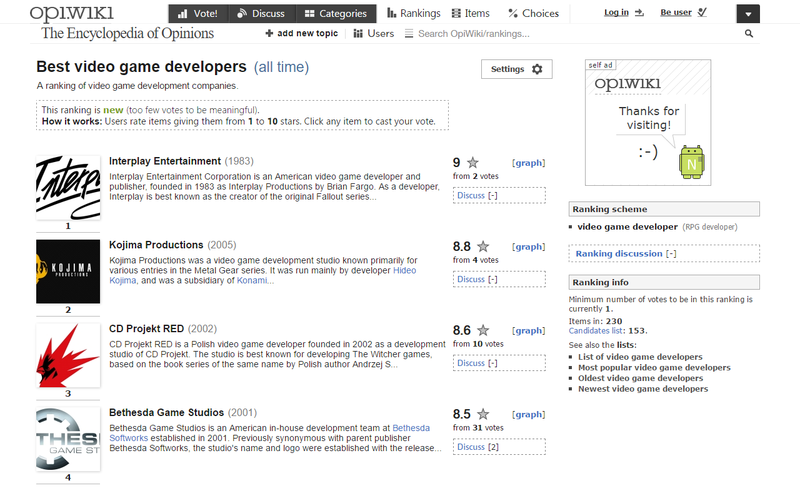 OpiWiki's features are not the only things that make the site special – in fact, one of our best assets are our users. We have many friendly and smart people aiming to discuss things substantively. 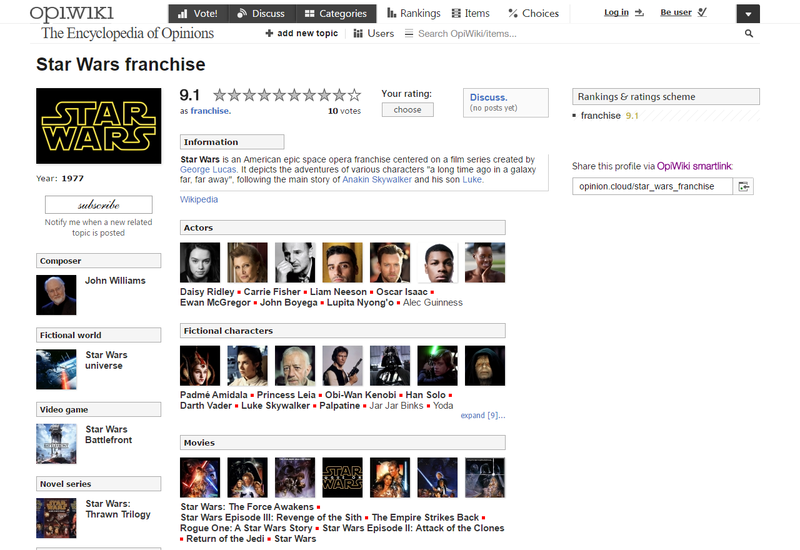 User rankings is our tool to find great people. 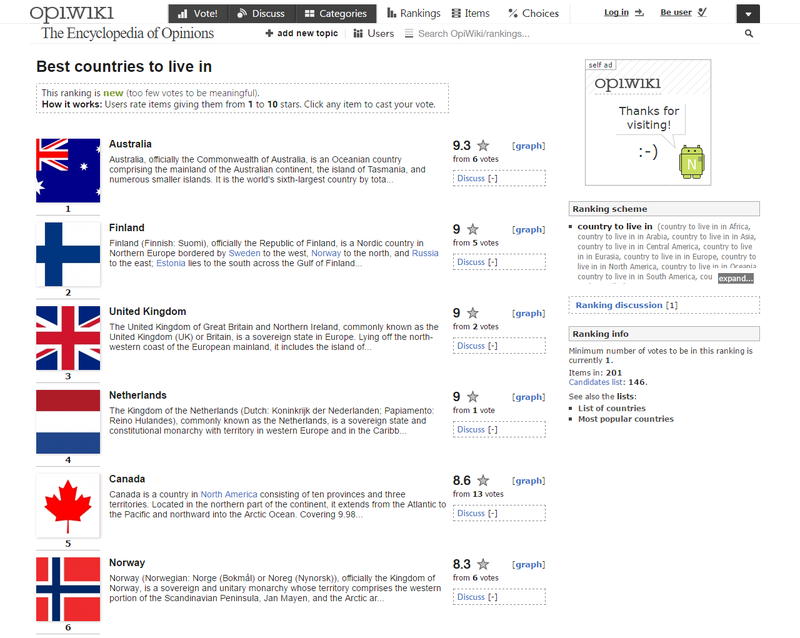 Being an OpiWiki user can be a great thing to do on a daily basis. Gaining the karma or accordance can be like playing a game, except you're doing it by sharing your real-life thoughts and by making a real contribution to the world – by helping other people to make up their choice. 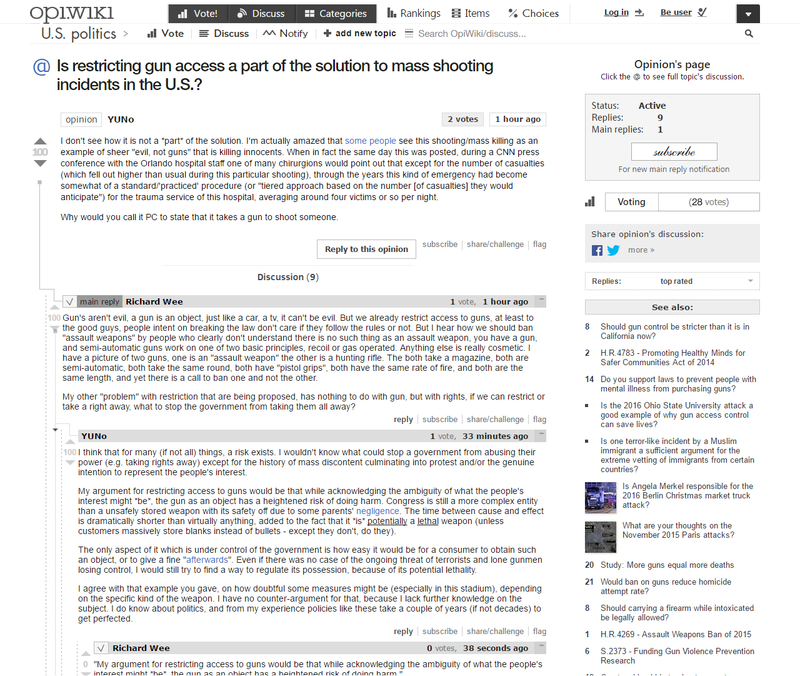 Layout is what sets the neat and elegant tone of OpiWiki. Designed over a period of months, it's built on more than 20 fonts uniquely put together to create a result you've never seen on any other website. OpiWiki is full of complex solutions, but it's also rich in little features that make the site special. We did our part, now it's your move to discover them all!